Moncloa는 LCD 케이블 TV와 무료 Wi-Fi를 갖춘 객실을 보유하고 있습니다. 숙소는 유명한 쇼핑센터, 레스토랑과 병원 근처에 이상적으로 자리해 있습니다. 상파울루 금융지구 중심부에 위치한 파울리스타 대로와 꼰솔라썽 지하철역(Consolação Subway Station)은 각각 900m 거리에 있습니다. 과룰류스 국제공항은 Hotel Moncloa에서 30km 떨어져 있습니다. 상파울루 시내를 편리하게 둘러볼 수 있고 공항 정류장으로 환승 없이 이동하는 주요 버스가 호텔 앞에 1시간마다 정차합니다. 프라이 카네카 컨벤션 센터(Frei Caneca Convention Centre)는 Hotel Moncloa에서 150m 떨어져 있습니다. Moncloa는 무료 Wi-Fi, LCD 케이블 TV, 미니바와 업무용 책상을 갖춘 객실을 제공합니다. 모든 객실에서 도시 전망을 즐기실 수 있습니다. 욕실에는 샤워 시설이 마련되어 있습니다. 일부 객실에는 발코니가 딸려 있습니다. Moncloa Hotel은 신선한 과일, 주스, 시리얼, 빵과 케이크로 구성된 조식 뷔페를 매일 제공합니다. 모든 투숙객은 예약 확인서를 지참하셔야 합니다. 예약 후 신용카드로 사전 승인이 이루어집니다. 호텔에는 거동이 불편한 투숙객을 위한 객실이 준비되어 있지 않습니다. 브라질 연방법 8.069/1990에 따라 18세 미만의 미성년자는 부모 또는 지정된 법적 보호자와 동반하는 경우에만 호텔에 체크인할 수 있습니다. 미성년자가 부모 이외의 성인과 동반하는 경우 체크인 시 부모의 서면 동의서를 제시해야 합니다. 이 동의서는 양쪽 부모님이 서명한 후 공증 절차를 거쳐야 하며, 부모님의 공증 받은 신분증 사본을 첨부해야 합니다. 호텔은 무난했으나, 주변에 유흥가가 많아 새벽에 시끄러워 잠을 청하고자 하는 사람에게는 적합하지 않음. 처음 방문한 상파울로에서 묵었던 호텔 파울리스타거리의 비싼 가격을 피해서 찾아낸 곳으로 골목으로 10분정도 걸어들어가야 찾을 수 있다. 밤에는 유흥가 근처라 조금 시끄러울 수도 친절한 직원과 가격대비 시설도 만족스러웠다. repeat customer... Love the location! Really it was everything wecould have reasonably expected for the price. It was nicely located in the heart of the city. The room was good (nice power shower) the staff were welcoming and helpful and the brekfast was decent enough. I would definitely stay there again and recommend it to anyone travelling on a budget. It was quite nice, the place is in front of bars and a couple of places to eat. If you like alternative bars, this is the right place for you. Tried Hotel Moncloa because my usual hotel was not available during the time of our travel and were positively surprised. Don't expect a luxury hotel, but solid value for your money. 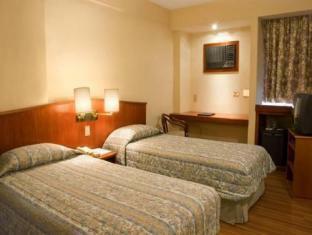 Hotel Moncloa was situated in a very central locations- only a shirt walk to the Main street Ave Paulista. The hotel was near many restaurants, shops and bars. The staff at the hotel were wonderful and constantly were helping us with directions and places to visit. The rooms were quite spacious and the beds were comfortable. A nice and central place to stay either on business or vacation. Staff was very friendly. They were doing renovations and there was a problem with the electrical outlet. 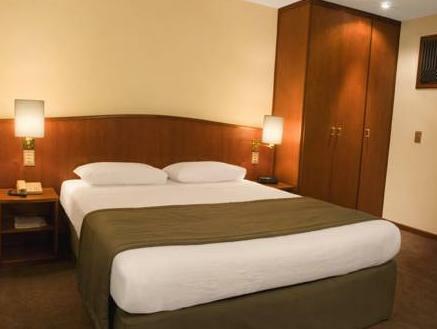 The Moncloa is a well-run, eight floor, smaller-sized 3-star Hotel. 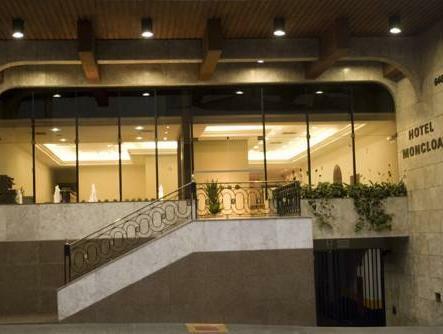 Located amidst the adult nightlife entertainment zone, 10 minute hike to Ave. Paulista metro. Bus to/from airport will drop off or pick you up in front of the hotel. Staff is professional. Room 705 was quiet, in back of building. Good quality linens, towels and reasonably comfortable bed. Small balcony with nice view. The room itself is spacious, with desk area, safe, small TV with many foreign language news channels. Furniture sort of old and low-end and room really needs to be repainted. Bathroom small, with very basic fixtures with water temp tricky to adjust. Free wifi was good, but it was dodgy at times needing the router re-set. Good breakfast. There are a number of similar hotels on this street, not all are listed on agoda. With the present realities of costs in Sao Paolo, the Moncloa is an acceptable enough choice if you want to be on Ave. Augusta for a brief stay. The staff is very friendly and helpful. The cleaning lady didn't even take the tip left on the bed during her room cleaning. I had to give it to her later. The rooms are nice and more than adequate. It was definitely worth the money paid for the room. The location could be a bit better, but if you're into nightlife Rua Augusta is the place to be! Apartamento com pouca luminosidade. Acessórios soltos. Gostaria alem dos comentarios que já fiz nos itens solicitados, de dizer a quem desejar hospedar-se neste hotel que se for um viajante solitário ou casal a negocios, terão muita tranquilidade pelo aspecto e tratamento caseiro do hotel. Apesar de algumas deficiencia na parte instrutural por ser um predio antigo, isso é compenssado pelo tratamento familiar recebido pelos clientes. O hotel deixa desejar no quisito alimentação, já que não dispôe de uma boa estrutura de restaurate, ficando o cliente submetido a pedir refeiçoes pelo telefone.